My new camera arrived yesterday!!! It's so tiny and cute! It's here just in time for the Christmas cookie baking - so I can take photos for the blog! 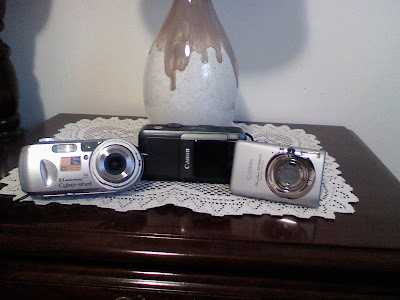 Here's a photo of it next to the broken one and SP's boxy one (I took the photo with my cell phone!). The broken one is on the left, SP's in the middle, and the new one on the right. It's a Canon PowerShot SD1200 IS Digital ELPH. I'm calling it 'Elf' - because it's an ELPH and I got it at Christmas time. I told SP he's not allowed to touch Elf. I've been carefully wrapping Elf's wrist strap around my wrist, just in case...!! 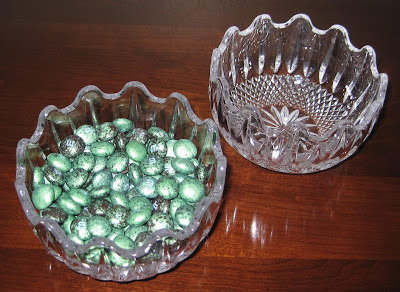 Here's Elf's first photo for the blog: Newly discovered Premiums Mint Chocolate M&M's in my grandmother's cut glass candy bowl. I LOVE these M&M's. I love chocolate & mint together. I am trying to have willpower, but seriously, I could eat that entire bowl in one day. When grandpa died last July, we had to clean out his house. One of the items I wanted was this candy bowl. As far as I can remember, it was always on grandma's shelf, always filled with candy for my brother & I. We would stare at it, trying to guess the kind of candy inside, working up the courage to ask if we could have a piece of candy. We would ever so carefully lift the lid, knowing that if we dropped it and broke it our parents would be very angry. Often there were M&M's inside. At Christmas, there was ribbon candy or those misshapen, different colored pieces of hard candy coated with very fine powder. Speaking of grandma, when I was a little girl, I used to go over to grandma's house and 'help' her bake Christmas cookies. Mostly I got to dump already measured ingredients into the mixing bowl and to decorate cookies. By the time I was in high school, I was baking Christmas cookies myself. I used to bake only 2-3 kinds, but with each passing year, the list seems to grow!! One year, I made so many kinds that my family had a 'cookie tribal council' to 'vote one off the cookie tray' (the cranberry-walnut were voted off; they got too soggy too quickly). SP and I have been discussing cookies for a few weeks and so far it seems likely that only 2 or 3 of the kinds from last year will also be made this year (but others from years past will make a re-appearance). We haven't finalized this year's cookie list. There's so many yummy possibilities!! Here's a photo and list of what we made last year - the cookie containers were stacked around my Pillsbury Doughboy Cookie Jar but he actually holds tea, not cookies! In case you're wondering, we didn't eat all the cookies ourselves! We gave cookies to SP's family, gave some to friends, took them to parties, and sent some to Georgia with my parents when they left Pittsburgh to go to see my brother & his family. This weekend we'll be stocking up on butters and flours and sugars. Get ready for lots of cookies! humanvacuum: the M&M's are funky looking - a mottled green & black color, and the candy shell is different from regular M&M's (not as hard/can't really be bitten off leaving just the chocolate interior!). But oh so yummy! I think I'll be Costco-ing for my cookies this year. How do you store them when you bake ahead? Just the freezer? Whitney: Storing is always an issue for me! Usually we have marathon baking for 4-5 days before X-Mas and just store in tupperware but this year we are too busy so we'll have to freeze. When I do freeze, I put a layer of waxed paper between each layer. I don't freeze cookies with preserves or other gooey ingredients.